Just some random Valentine shots around the house today. Working like crazy to get everyone their orders for Valentine's Day. We are having Spring like weather here in Southern California. I will try to send some warmth and sunshine your way. I know it's freezing and snowing in some parts of the country. It's in the 70's here today. Looking forward to the weekend. Saturday I'm going to the CALM show in Santa Barbara. A really great antique show, and for a good cause. Google CALM Antique show. Sunday it's off to the Ventura Flea Market. The first one in 3 or 4 months. I will try to get some photos of both events this time. I have a bad habit of forgetting my camera when I'm excited about going to these fun places. Then I get there and realize my camera is in my studio. My friend Kym owner of A Beautiful Mess Antiques will have a booth at the Santa Barbara show. Can't wait to see how she is presenting her wares. She has an amazing knack for design, merchandising, and decorating. Plus who doesn't want to go to beautiful Santa Barbara California? Hope you all have a fun weekend planned too!! Hope you are having a nice week. We have been having a mini heatwave here. I have been busy working on more and more Valentine projects. These are a few of my new crowns and monograms. I don't know how you all keep up with the projects, house stuff, and blogging. It's a balance that I sometimes don't have lately. The blogging comes last when I'm in the project mode. I have been getting busier and busier with orders which great. That leaves me with less time to blog and visit blogs. I'm always thinking about you though. 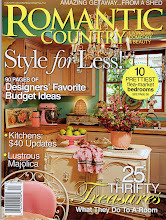 If you have gotten your Feb copy of Romantic Homes magazine, be sure to read the article and 6 page spread of my friend Kym's shop A Beautiful Mess Antiques in Agoura Hills California. You can visit her website as well. Her shop is amazing! In case you were wondering, I'm still here making hearts. I have been making hearts all week long, and I'm still not done. It's kind of disheartening. Not really, just busy with the Valentines. I still have more to go, and some custom crowns as well. If I'm not visiting you and your lovely blogs, that is why. The weather has finally warmed up a bit here, and the sun is shining bright which makes for some beautiful natural light to work in. I hope you all have some fantastic weekend plans. I will be here finishing up these hearts and trying to deliver all of them. Baby Jake update, he is walking, and talking and giving great hugs these days. He has a hilarious personality!! He will be 16 months old next week. Amazing how the time flies by. Hope you are having a good week. I have been busy at work on these new Valentine Hearts!! They will be going to the Agoura Antique Mart soon, so I wanted you to see them before they left home. Each one takes some time, but the end results are again worth it. I wanted to go for a more natural look than the typical red and pink hearts. As in the previous post, I'm still trying to figure out how to get my favorite places list back as it disappeared this morning. If anyone knows how to do that, please let me know. I guess for now my favorite places are floating around somewhere. Need your help, if anyone knows. I was trying to add another favorite place to my list, and lost the whole list. If you know how to get it back please email me or leave me a comment on how to retrieve the list??? I'm having a frustrating morning!!!! It's all about the hearts now. It's full speed ahead on the Valentine creating. This is a tiny sneak peek at what I'm working on. The holidays were fun, but I'm glad it's back to normal. All the decorations are put away, the lights are down, and the house is decorated for winter. Next will be the Valentine decorations. That is a much easier and simpler project. I hope you have a great week. I will be here in the studio working away if you want to stop by and say hello. It's quite cold for Southern California, and we even had a freak snow storm yesterday, so I'm very happy to be in the studio working. That is after my morning walk. I guess I need to bundle up and get out there.